The original plan with this song was that I wrote the music and words, and Claire was going to write the melody. My writing has generally not showed off her full range. I wrote the chords and words last year, but somehow we never got round to sorting out the melody. When it became apparent that everyone would be available for the date in May, we dug Struggle Street out, I dusted off the words (i.e. rewrote some) and then set about writing a melody in falsetto. It seemed like a nice idea to have each of the three of us sing a different verse (something that we’ve done in strangeday, but not Roo’s Radio – I don’t *think*). I was aiming for a bit more of a pop feel with Struggle Street. I guess you can be the judge of whether I succeeded. It’s not a genre I’m hugely knowledgeable about, but everyone loves a good pop song, right? When the track was done, there seemed to be something missing. So we sent it to Gareth Cousins (who played on Stare) and he came up with some gorgeous electric guitar parts, which rounded the whole thing out nicely. 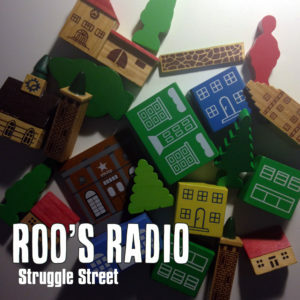 Struggle Street is one of those phrases that seemed to take off within the band: “I’m on Struggle Street this morning” etc. so it seemed like a fun title for a song. But as it developed it became a little bit less of a fun song and more of an encouragement to other people struggling. Which is a timeless message.